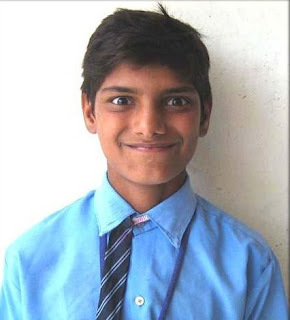 Firasat is a 12 year old student from Uttar Pradesh. His father works as a fruit vendor, while the mother helps out by pressing cloths by ironing. He has 3 sisters, of whom the eldest being married. They had migrated to Delhi with hopes of making it better financially. Firasat's father earns Rs.100 to 200 in a day out of which he has to purchase fruits for the next day's sales too. He works very hard. Firasat's mother is very sick, therefore not able to help out much. His young sister has undergone a surgery, and he has to help out his mother with chores at home. As things are quite challenging for a boy of this age, Firasat is very determined not to drop out of school and to make the most out of it. Some times his mother tries to stop him from education as she sees it as a futile effort and thinks it is better for him to start earning. But he has dreams of being an army officer one day.